Sam and Sara have been married for a number of years, and have made the difficult decision to get a divorce. They are both in their 70s, and jointly own their house with a value of $600,000. Sara wants to stay in the family home; Sam is agreeable but wants to be able to buy a small condominium. However, there is a $200,000 mortgage on the family home, and the current lender is not willing to release Sam from that obligation unless it is paid off in full. The lender’s position is that Sam and Sara both signed the loan documents, and this cannot be changed. Sara does not have the financial ability to refinance the existing loan, and Sam is concerned that if he puts his name on the refinance for Sara, he will not be able to buy the other property. This is a very common problem throughout the country. With the divorce rate increasing among seniors (the so-called “silver” divorce), too many couples seeking a divorce either have to sell the family home, or the spouse who will not remain in the property is unable to buy something else. One possible solution: use a reverse mortgage for both transactions, typically referred to as HECM or Home Equity Conversion Mortgage. The minimum age to obtain such a loan is 62. Lenders use the age of the youngest borrower since their life expectancy is theoretically longer, so both owners must be at least 62 years old. 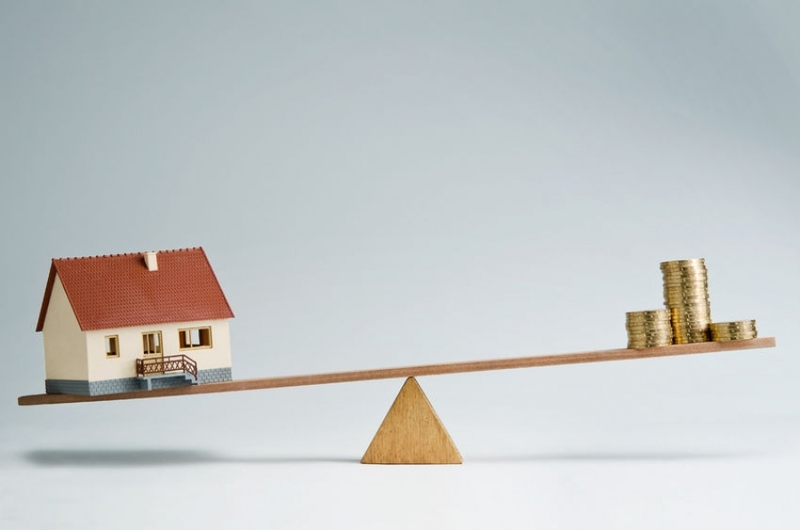 The down payment is calculated using the age of the borrower, but the price of the house and current mortgage interest rates are plugged into the calculation. From talking with lenders, the older the borrower, the less down payment is required. If you are interested in going this route, a reverse mortgage lender will be able to assist you in with all of the details and the financials. Sara opts for a reverse mortgage. Using a calculator that can be found on the web it appears that Sara can get approximately $286,000 from an authorized lender. The $200,000 mortgage will be paid off, and Sara will be able to live in the house without having to make any more monthly mortgage payments. She will, however, have to pay the real estate tax, maintain proper insurance coverage as well as keep the property in good condition. In our example, in addition to having the current mortgage paid off, Sara can also get a lump sum of $86,000. In consideration for Sam agreeing to transfer his interest to Sara, she can agree to give him those funds, which he can then use as a down payment on the condo he wants to buy. Sam would be using what is known as a Home Equity Conversion Mortgage for Purchase, HECM for Purchase or simply H4P. Once again, every situation is different, but in general – and depending on Sam’s age at the time he makes the loan application – he will be able to get a reverse mortgage loan of between 47 and 52 percent of the purchase price of the new property. The older you are, the more money you are eligible to get. There are a few requirements: You must live in the new property; it must be your principal residence. You must go through consumer counseling; the lender – and the government – want to make sure you fully understand what you are pursuing. And you must prove you are financially able to pay the real estate taxes, insurance, general maintenance and upkeep and any applicable community association dues. If Sam and Sara both qualify for their HECM, Sara will stay in the family home, Sam will have his own condo, and neither will be obligated to pay any mortgage so long as they continue to reside in their respective properties. A reverse mortgage — or in this case a double reverse — is not for everyone. While it does solve a major problem many divorcing couples have, you must do your homework as soon as you have reached agreement to divorce. Sam and Sara must talk to their financial counselor and to their respective attorneys. There is a lot of information on the web about the HECM. Do not, however, rely on promises you hear from celebrities hawking the concept on television. Both the Housing and Urban Development and the Federal Trade Commission — as well as AARP — have extensive informative material on the web.